"1) Exxon Mobil made $19 billion in profits in 2009. Exxon not only paid no federal income taxes, it actually received a $156 million rebate from the IRS, according to its SEC filings. Fairness implies that taxing the rich more is unfair because it punishes them for being who they are . . . rich! There're problems at many levels here--cohorts are different for scads of reasons--accident of birth, innate abilities, appearance, etc. But few are the rich, I suspect, greeted by the sun at dawn who fret about breakfast. Things are not often as they seem. The world is complex and that forces us to drill below the surface of our intuitions for answers. First, people behave differently in response to their environment. In a complex world, oftentimes people seek complex methods to find simple answers to questions shaped by intuition. For instance, I want to know how people (taxpayers) respond to stimuli--that is, tax cuts. Do people work harder if they are rich, or poor? I contend the answer is yes, economic status matters. But I was not satisfied with just asserting that answer. I wanted proof--not mind-bending mathematically sophisticated proof, but simple testable data supported answers. Well, to support my approach choice, I invoked Occam's razor, which says "the simplest explanation that fits the facts" is the best. So, while it is true that many factors determine economic performance--employment, investment, confidence, economic stability, even perhaps geography, in the current political environment we are being led to believe that the solution to the economic malaise is tax cuts. The political conversation of the two presidential candidates is centered around the economic merits of changing marginal tax rates. So, ignoring other factors of growth, I looked solely at economic performance in relation to marginal tax rates. To address this conversation with evidence, I sought out data online for real gross domestic product (GDP) in 2005 dollars from 1913 to 2011. I also got data on top and bottom marginal rates for the same period. Three graphs were developed from this data--one for the Kennedy Administration, another for the Reagan Administration, and a third for the Clinton Administration. Later in the analysis 100 years of data are used to examine the effects of changes in the marginal tax rates on economic growth in the long run. However, the actual statistical results were not shown but can be requested from the author. Again, there is a sense of universal bragging that cutting taxes ipso facto leads to economic growth. Yet, a plausible counterintuitive argument can be made that high top tax rates don't necessarily mean poor economic growth--don't believe me, just look at the Figure 3 for the Clinton Administration below. Note in the graphics below, TMTR is the top marginal tax rate line, BMTR is the bottom marginal tax rate line, and GDPGR is the real GDP growth rate line. 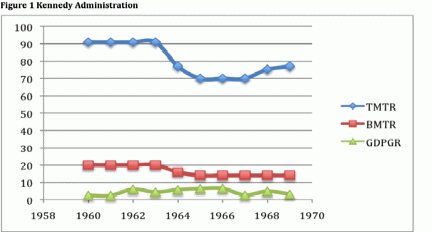 Figure 1 above represents the Kennedy years (1961-1969)--though he died in 1963. The very top line is the behavior of the top marginal tax rate from 1960 to 1969. The mid line is the bottom marginal tax rate, and the last line at the bottom of the graph is the annual growth rates of real GDP. Figure 1 show, too, that in the early years of the 1960s the top marginal tax rate was in the stratosphere. The Revenue Act of 1964 reduced the top marginal rate from 91 percent to 70 percent, which resulted in growth rates of 5.3 percent (1965), 4.5 percent (1966), and 5.5 percent (1967). Note, rates were increased in 1968 and 1969 but economic performance just mirrored 1962 and 1963 when the top marginal rates were 91 percent. The upshot seems to be that reducing the top marginal rates spurred economic growth, but raising them a little had mixed results. Of course, this questions the merits of the tax cuts absolutism as an economic strategy in a small way. Republicans obstinately refuse to give, even a little on this position. In their lexicon compromise--the given and take in negotiation for the public good--is surrendering principles. This is commendable only if it can be argued with absolute certainty that tax cuts have the effects they assert--i.e. improve economic performance. Figure 2 below depicts the Reagan Administration and the steep cut in the top marginal tax rate from 70 percent to 50 percent, although the bottom marginal top rates (the second line) went from 15 percent to 10 percent (not much of a change by comparison). The effect of the Reagan tax cuts on real GDP growth (bottom line) was spectacularly positive. It rebooted the recovery in 1982 in a way that saw a whopping 7.18 increase in real GDP in 1984. However, further cuts in the top marginal tax rates between 1986 and 1988 did not increase economic growth. Nor did the increase in the bottom marginal tax rates from 11 percent in 1987 to 15 percent in 1988 change the real GDP growth rates. Here we begin to realize that tax cuts do not draw a straight line to economic recovery, and might even harm it. The story of the Reagan tax cuts seems murky. Trace the behavior of the changes in the top marginal top rates and the bottom marginal tax rates on real GDP performance (1982), and what you see is that in some years lower rates produced worse economic performance, and constant tax rates correlate with better GDP growth (1984). Once again a dogmatic adherence to tax cuts by either side of the political aisle as a means to economic growth is not supported by Figure 2. Figure 2 confirms the argument that there is little relationship between marginal tax rates at the top and economic performance. To reiterate, the Reagan tax cuts were enacted in 1981 and by 1982 the economy took a nosedive. It recovered in 1983 and 1984 and output fell again and did not rise much by 1989; raising the bottom marginal tax rate made no difference for the growth rate of the economy in this instance.